Home / Posts Tagged "zip"
How do I get multiple files and folders to zip into a single zip file? This is a question we often get from users. It isn’t possible to do this in version X (at least not in a decent way). That’s why we decided to add this in version XI (starting from v11.9.13.0). The (UN)ZIP Destination Setup Form where you select ‘ZIP’ and your destination directory of the zipped files. Next screenshot is taken from the ‘ZIP’ tab. 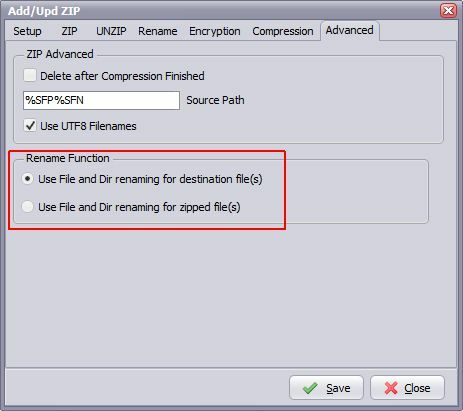 Here you can choose between zipping to seperate files or to a single destination file. The default is to seperate files so we are compatible with previous versions. 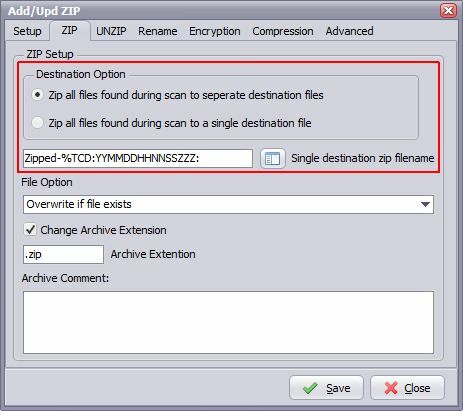 When zipping to a single destination file is selected then the option below will be used. This option is called the ‘Single destination zip filename’. This is the destination filename that will contain all files found during a single scan. We’ve add a parameter button on the right so you can use variables in this filename (NN = minutes and ZZZ = milliseconds). We’ve also added a new advanced option (‘Advanced’ Tab). Now you can choose whether to use renaming with the destination zip filename (=default) or renaming of the files in the zip file. So now you can rename the source files found during a scan inside the destination zip file. In version 10.5.25.0 we’ve added a ZIP destination option.